We’d love your help. 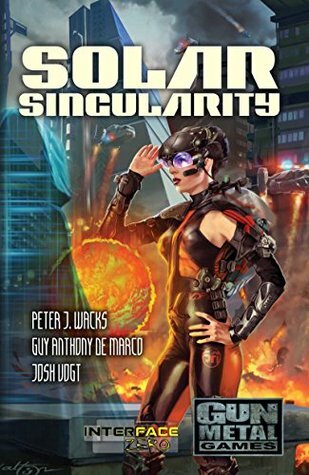 Let us know what’s wrong with this preview of Solar Singularity by Peter J. Wacks. Dubbed Interface Zero by those who created it, the Tendril Access Processor—or TAP—downloads the Global DataNet and Hyper Reality directly into the minds of billions of users across the solar system, bringing the world an unparalleled level of interconnectivity, and danger. Malware plagues the Deep, and hackers manipulate the Tendril Access Processor to upload malicious viruses, to steal secrets, and even the identities of the unwary. In 2088 a massive solar flare disrupts Earth's satellite network, leaving the world in chaos as all TAPs malfunction simultaneously. Hyper Reality overlays are indistinguishable from the physical world, and global riots make the whole world a war zone. Amidst this madness, two AIs go to war, using humanity as their pawns. To ask other readers questions about Solar Singularity, please sign up. Two self-aware artificial intelligences exist out in the vast computer network that connects humanity. One of them, called Charon, would be happy to see the end of humanity. Another, called Prophet, thinks artificial intelligence can work with humanity. Both are disrupted when a solar flare hits the Earth. Before the solar flare hits, Prophet sets five people on a quest to be reconstructed in the aftermath. Charon plans to use the chaos in the aftermath to keep that from happening. The five char Two self-aware artificial intelligences exist out in the vast computer network that connects humanity. One of them, called Charon, would be happy to see the end of humanity. Another, called Prophet, thinks artificial intelligence can work with humanity. Both are disrupted when a solar flare hits the Earth. Before the solar flare hits, Prophet sets five people on a quest to be reconstructed in the aftermath. Charon plans to use the chaos in the aftermath to keep that from happening. The five characters on the quest are well realized and I found myself caring about each of them and I particularly enjoyed seeing their interactions with each other as they grew through the novel. One element of this novel I really liked was that it felt like cyberpunk done right. This portrayed a realistic view of humanity, always wired into the internet, living and working as people do, until the technology is suddenly yanked away from them. This felt authentic and I didn't have to willingly suspend disbelief, I felt like I was seeing a possible future. The reality sucked me in and characters I could believe in propelled me through to an ending that was satisfying but demands a sequel.